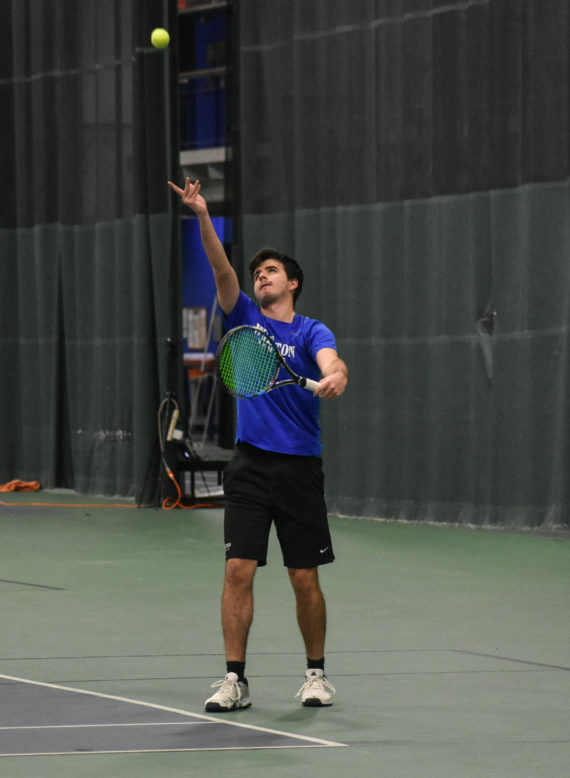 The Wheaton College men’s tennis team is off to a blistering start this Spring season, picking up wins over both the University of Massachusetts Dartmouth and Stonehill College over the weekend. The team swept UMass 9-0 and edged out Stonehill 5-4. Wheaton player making a serve. Photo by Caroline Chaffiotte. Over the course of the weekend, few competitors had bigger showings than first-year Ian Tracy ‘22. Tracy ‘22 has emerged this Spring season as the number one singles competitor at Wheaton. In the match against Dartmouth, Tracy ‘22 and sophomore Javier Esteban de Celis ’21 defeated the top-ranked doubles competitors. In the following match, both Wheaton players picked up singles victories against those same doubles competitors. With the sweep, two of the team’s captains won their matches. Senior Jeremiah Ryser ’19 and junior Jorge Aguirre Martinez ’20 conquered their opponents 8-0 from the number three spot. Junior Zach Strempel ’20 collected a 6-1, 6-2 victory from the number five spot. Third captain senior Nick Hotary ‘19 did not participate against UMass Dartmouth or Stonehill. The second day of the weekend was not without its hiccups, despite the result. While Wheaton was able to take all three doubles matches, Stonehill came together at the start of singles sets to tie the score at three apiece. After Aguirre Martinez ’20 was able to sweep the second set against his opponent for a come-from-behind victory in the number five spot, the fate of the afternoon was left to Tracy ’22 in the number one spot. The match was close from the outset, where Tracy fell 4-6. After taking the second set 7-6, Tracy ‘22 started to fall behind, starting the set 2-5. Able to use the support of his team as fuel, Tracy ‘22 roared back to take the set and the day with a 7-6 victory. After such an impressive outing, Tracy ‘22 was happy to shed some light on his mentality during that last match. “The biggest deciding factor of the third set and the entire match was how on key moments my opponent showed some mental weakness, and I was able to hold on,” said Tracy ’22. Stressing the mental games he played against his opponent, Tracy ’22 cites the “mental change” he made part way through the third set in order to throw off his opponent. While the men’s team certainly got off to a great start, one thing is conspicuously missing: the women’s team. In fact, the athletic schedule does not have a women’s match scheduled until March 11. Regardless of the long wait, coach Pauri Pandian is certainly keeping the team ready to compete when their schedule begins next month.